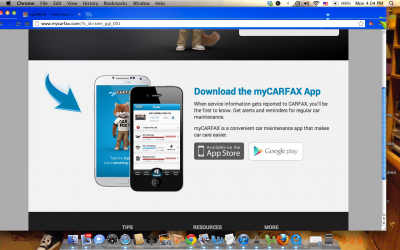 Carfax, which offers buyers of used cars a detailed history, has a new app for all car owners. myCarfax, for owners of new or used cars, notifies you when your next routine service is due. The app, for iPhones and Androids, has a recommended schedule of preventative maintenance at various mileage intervals for every make of car and keeps track of your car’s service history. And it’s free. So no more sticky notes on the dashboard or on your desk calendar.